You better be because today marks the first of many Halloween recipes that I’ll be sharing with you as part of Health-oween! Get your caldron ready, set your eye of newt aside and prepare yourself for some ultra creepy treats, breakfasts, dinners and drinks. 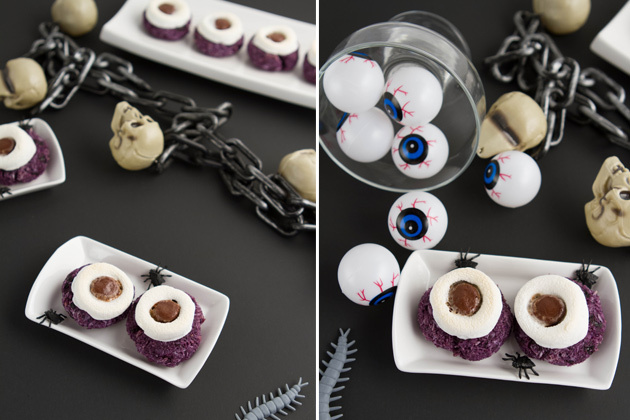 First recipe – monster eyeballs! 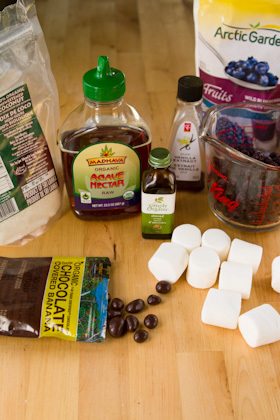 (shhh…they’re vegan blueberry macaroons with a marshmallow and chocolate topping). 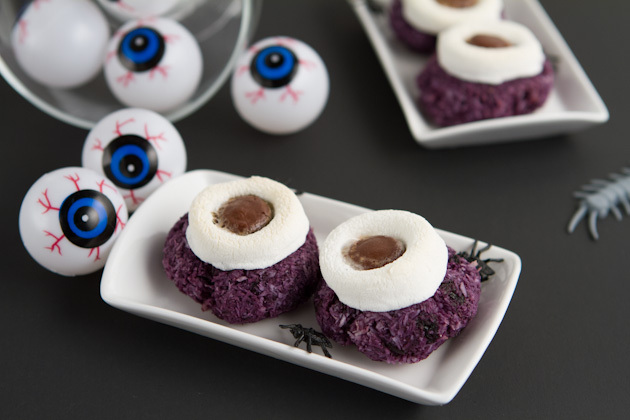 After I made these I realized that I could have gone a step further and made them a healthier by using banana slices for the white section of the eyeballs. I’m kicking myself for not thinking of this option sooner! I can’t tell you how long I racked my brain trying to figure out how to make these eyeballs. Kevin and I stood in the grocery store for what seemed like forever running through the possibilities and not once did banana come up. Eh, there’s always next year! Vegan blueberry macaroons topped with marshmallow and chocolate pieces. Dessert... or monster eyeballs? Add coconut and mix with a spoon until it's completely coated. Return to the oven and cook for 2-3 minutes. Watch carefully so that the marshmallow doesn't burn. Many of the ingredients I used in this recipe were sent to me from Fair Trade USA in celebration of Fair Trade month. I wasn’t sure what I was going to do with the dark chocolate covered bananas so I’m happy I put them to good use. Sure, I could have just eaten them (it was hard not too!) but they were screaming to be added to a recipe. Begin by adding the ingredients to your frozen blueberries and making your chia egg. And then add coconut and really mix-mash around until it’s all coated. 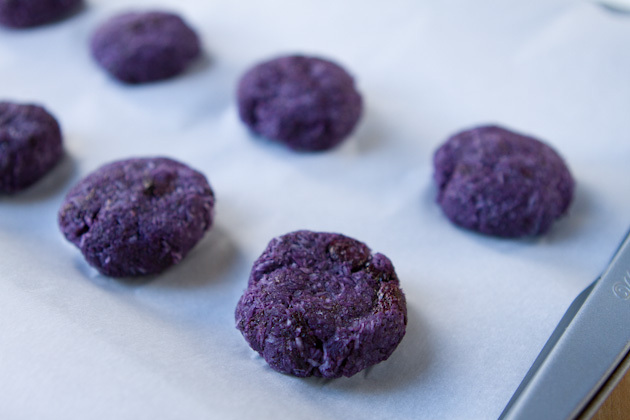 Press into little purple mounds and place in the oven. While they’re cooking, prepare the marshmallows or banana slices. You want them to be no thicker than 1/4-inch. Punch a hole in them with the back of a nutcracker or pen, or straw… just so that the chocolate piece can be pressed inside without popping up! 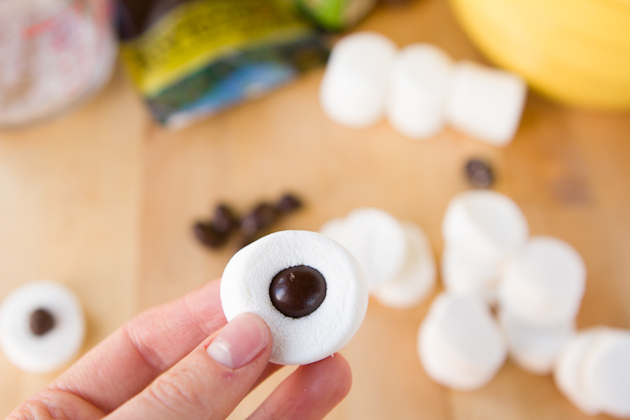 Press the chocolate piece into the marshmallow or banana slice. Once the macaroons are complete, place the completed eyes on top and return back to the oven. This stage is there just to melt everything together. Be sure to watch carefully so that nothing burns…. although a slightly charred marshmallow may look a bit more monster-like. Allow them to cool slightly before serving with a side of flies. 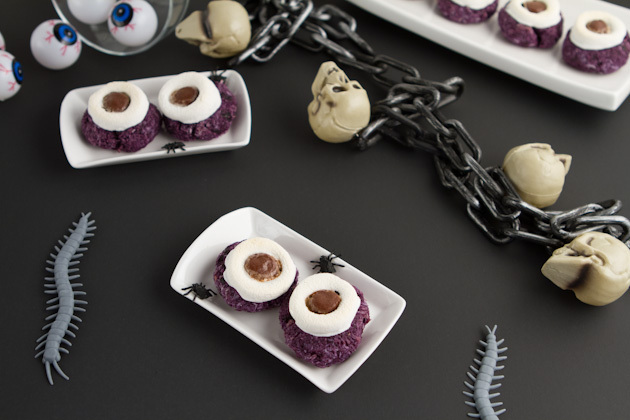 Do you have a favorite Halloween recipe that you’re dying to make a bit healthier? I’d love to hear about it!